This is a story of the days of chivalry in England and of young Myles Falworth, son of a lord unjustly disgraced for treason, who was forced to make his fortune as best he might in the days when men seemed made of iron. How he entered the service of a powerful lord, rose to knighthood, defeated his father's old enemy in thrilling combat, and at last won the friendship of the king is told against a background of the dangerous times of the 14th century that makes them live again. In the rich turbulence of English history, one day stands magnificently apart: June 15, 1215, the day of the signing of the Magna Charta. On this day, the first blow for English freedom was struck and forever affected the Western world. Here is the story of three true men, Stephen Langton, Williams Marshall, and Hubert de Burgh, whose heroic deeds are set against those of the ever deceitful and crafty King John. Howard Pyle (who also wrote The Merry Adventures of Robin Hood) weaves the tales of chivalrous Knights, the magic sword of Excalibur, the Magician Merlin the Wise, and the legendary Arthur, later to become King of Britain. Pyle describes bouts of jousting, and knightly jealousies played out in grand style. Even in our present day, these stories last and challenge us to be our best, truthful, brave, and always wanting to right wrongs to those who cannot speak up for themselves. Howard Pyle was born on March 5, 1853 in Wilmington, Delaware. From the time he was a very small boy he loved pictures, especially the pictures in storybooks. Among his favorites were Grimm’s German Fairy Tales and Arabian Nights. At the age of twenty-one, Pyle began to contribute illustrations and fables to St. Nicholas magazine and later went on to write and illustrate books for children. 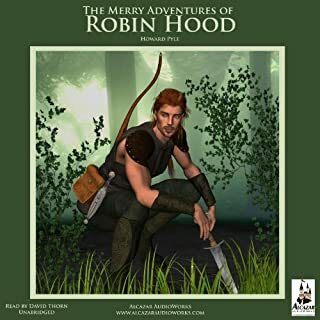 His first was The Merry Adventures of Robin Hood in 1883. The Story of King Arthur and His Knights the book that was wrapped and placed under Christmas trees in my childhood in Canada in the 1950s. Lilting prose describes an entertaining world of idyllic countryside and cartoon violence. The narration is perfect, in my opinion. I look forward to enjoying this audiobook with my grandson, a 6-year-old Jedi. 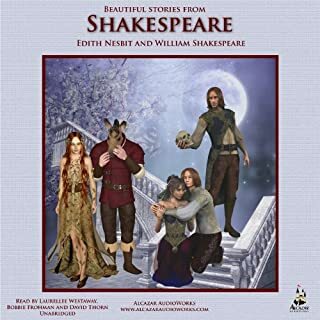 For a complete adult telling of the stories of King Arthur, listen to Malory or T. H. White, because Pyle’s The Story of King Arthur and His Knights is only the first of his books about Arthur, recounting Arthur’s birth and youth and winning of Excalibur and Guinevere, and then Merlin’s fate and the stories of Sir Pellias and Sir Gawaine. Moreover, Pyle moralizes after the episodes, telling us, for example, that although we may not literally become knights with swords, we may wield truth (Excalibur) and faith (its scabbard). As for David Thorn’s reading, his nearly tongue-in-cheek delivery was perfect for Jonathan Stroud’s Heroes of the Valley, but almost seems out of place here, for Pyle reveres Arthur, “the most honorable, gentle Knight who ever lived in all the world,” and his knights, while Thorn’s heroes often sound nasally arrogant. And a woman reads Pyle’s chapter titles and descriptions with an American accent and syrupy manner, jarring next to Thorn’s British English. And each chapter closes with repetitive pseudo medieval music fit for a cheap computer game. And the Story of King Arthur has plenty of exciting and humorous moments and scenes of sublime wonder and beauty. And knights, wizards, faeries, dastards, damsels, hermits, quests, enchantments, disguises, combats, loves, hates, oaths, betrayals, humiliations, machinations, and glorifications. Despite Pyle’s exaltation of Arthur and company, they are often humanly proud, foolish, seducible, and violent. And Thorn reads all with energy and accuracy. 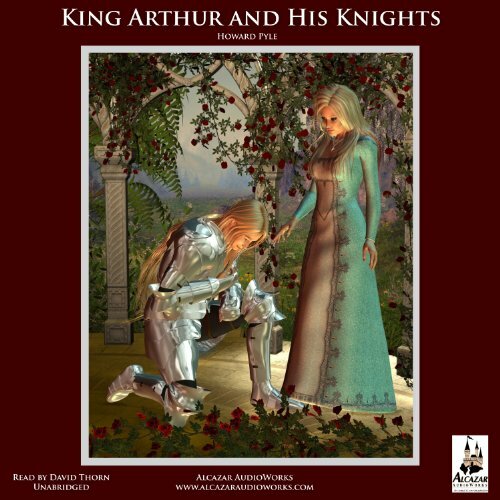 For a complete adult telling of the stories of King Arthur, listen to Malory or T. H. White, because Pyle's The Story of King Arthur and His Knights is only the first of his books about Arthur, recounting Arthur's birth and youth and winning of Excalibur and Guinevere, and then Merlin's fate and the stories of Sir Pellias and Sir Gawaine. Moreover, Pyle moralizes after the episodes, telling us, for example, that although we may not literally become knights with swords, we may wield truth (Excalibur) and faith (its scabbard). As for David Thorn's reading, his nearly tongue-in-cheek delivery was perfect for Jonathan Stroud's Heroes of the Valley, but almost seems out of place here, for Pyle reveres Arthur, "the most honorable, gentle Knight who ever lived in all the world," and his knights, while Thorn's heroes often sound nasally arrogant. And a woman reads Pyle's chapter titles and descriptions with an American accent and syrupy manner, jarring next to Thorn's British English. And each chapter closes with repetitive pseudo medieval music fit for a cheap computer game. 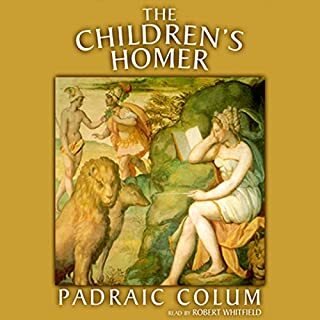 Nonetheless, there is much to enjoy and admire in this audiobook. 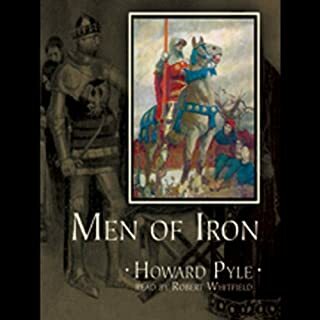 Pyle assumes a vivid and muscular "medieval" style, as when Arthur jousts a knight "out of his saddle like a windmill "whirling in the air and smiting the earth so that the ground shuddered beneath him." Or as when Arthur delivers some justice: "At this, the face of that knight fell all pale, like to ashes, and he emitted a sound similar to the sound made by a hare when the hound lays hold upon it. Then King Arthur catched him very violently by the arm, and he catched the locket and brake it away from about the knight's neck, and upon that the knight shrieked very loud, and fell down upon his knees and besought mercy of the King, and there was great uproar in that place." And the Story of King Arthur has plenty of exciting and humorous moments and scenes of sublime wonder and beauty. And knights, wizards, faeries, dastards, damsels, hermits, quests, enchantments, disguises, combats, loves, hates, oaths, betrayals, humiliations, machinations, and glorifications. Despite Pyle's exaltation of Arthur and company, they are often humanly proud, foolish, seducible, and violent. And Thorn reads all with energy and accuracy. Poor narration choices, but great story. The woman narrator was distracting. The gentleman, though, did very well. I wish she wasn't part of it. The various King Arthur stories are always wonderful. This offering is called pleasant listen, with an emphasis on duty, honor, grace, and nobility. In my opinion, this book has great and perfect narration that fits the story well. And the story is a good one, though it was very predictable which is the only reason why I gave the story part four stars instead of five. I would really recommend this book. Narration and transition music was awesome. Had to choose to stay on the story cuz it's a "good historic tale*, THEN I enjoyed the stories. Good choice to" read" but had to choose it. Sweet mercy, it is slow!!! I would only recommend this book for someone ten or under. A child may find it amusing to have predictable stories dragged out endlessly, but I didn't. Pyle is verbose to the point of madness. The chapters about the winning of Guinevere are exceptionally tedious. Arthur disguises himself as a low gardener's boy in order to SPY on her! Then has a merry old time deceiving and humiliating his knights, his enemies, even the gardener. He rides out in disguise and defeats four knights in a row, We know in advance that he must prevail, but Pyle tells each story with the same, repetitive, grueling detail. In short, what should've been amusing, short tales are padded far past the point of interest. I knew there was a good reason why I couldn't make it through the book when I tried reading it as a teenager. Nothing dealing with King Arthur. I don't have a favorite scene. They were all so diluted with words that in the end, they had almost no impact. Do you think The Story of King Arthur and His Knights needs a follow-up book? Why or why not? Nooooo, Pyle has exhausted the subject entirely. I love the style of language Pyle uses, but there is too much of it. An economy of words, to the tune of eliminating 40-50% of them, would've served the stories better. 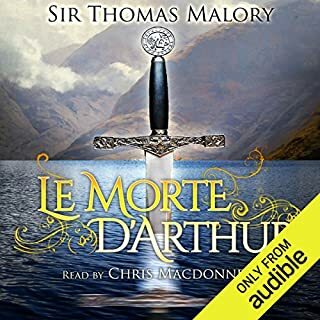 What you do get in this book is fantastic and everyone should give it a listen, however it is only half the story about king Arthur. Throughout the story the author teases the reader about sir Lancelot, however the story stops abruptly halfway through the legend before we even get to Lancelot, promising to release another book with the rest of the tale, this book as far as I am aware doesn't exist. It is extremely disappointing to only get half a tale and not have a chance to hear the other half, especially when the tale is enjoyable. 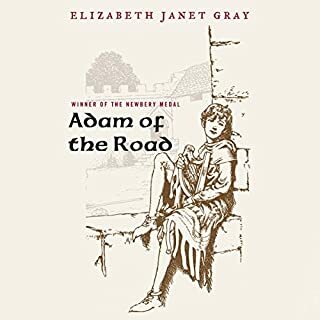 The performance is great, although a artificial sounding American voice breaks up the chapters and pulls the reader out of the calming immersion the narrator, David Thorn, creates.